Mint and lemon are perfect together in the Chili Lime mocktail. Mint and lemon are a classic combination that never fails. 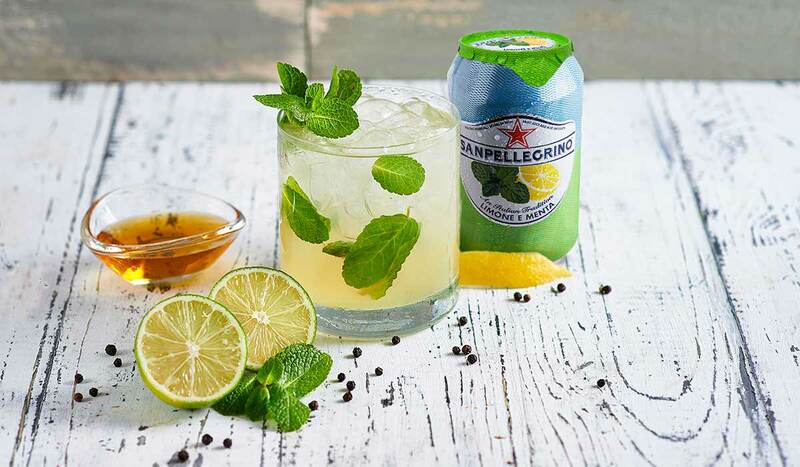 For times when classic just won’t cut it, mix up a Chili Lime – Sanpellegrino Limone e Menta gets a twist with fresh lime and agave syrup for an exciting mocktail that enlivens all senses. Stir it up and cool yourself down with the Chili Lime mocktail. Cool mint brings out the softer side of lemon and lends an herbal edge, whilst agave syrup rounds off this exciting mocktail that will induce the second sip without you even knowing it. The perfectly effervescent Chili Lime non-alcoholic cocktail has flavors that sparkle in your mouth. Make it right with some pizza with mortadella or a Sicilian scacciata, and entertain effortlessly the next time your friends come over with the Chili Lime. In the bottom of a sturdy, large glass (40 cl capacity), pour the lime juice and add the mint and syrup. Combine well by stirring gently with a bar spoon, then fill the glass with ice. Top up with Sanpellegrino Limone e Menta. Garnish with lemon peel and fresh mint. If you are 18 years old or over you can turn the Chili Lime into an alcoholic drink by adding 1 oz/3 cl of pepper vodka.